Prior to having lunch at Bentei Sushi, we had noticed a Chinese bakery a few stores down. In big Chinese characters, it boldly stated that they had freshly made pastries. 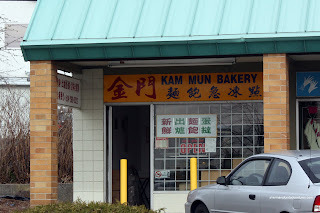 For me, I was a bit taken aback that there was a Chinese bakery in this strip mall at all. Very random... From the outside, it doesn't look that appealing. On the inside, it didn't get much better. Well, we didn't come to admire the decor, we were here for the pastries and buns only. As expected, there ain't a large selection. Furthermore, at first glance, the goods for sale here don't look all that great either. Ah... but looks can be deceiving. My initial reaction to the Egg Tarts was quite skeptical. Look at it. The egg custard looks pale and undercooked. While the tart crust appears to be falling apart. 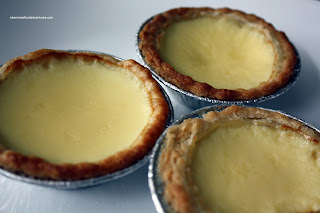 However, much like that dorky kid you knew in school who became a stud or hottie afterwards, the egg tart really surprised. Ignoring the colour, the egg custard was silky and not too sweet. The crust is extremely flaky, to the point that it barely stays together. It may look awful; but it's surprisingly good. Yah, trust me, I was quite shocked too. I was ready to hork to tell you the truth. Now, the Cocktail Bun wasn't that impressive. I thought the bun was a bit dry and slightly dense. Furthermore, the filling was very sparse, thus not having any impact in terms of flavour. The little bits of coconut that I did get was not really all that sweet, which to some people is a good thing. 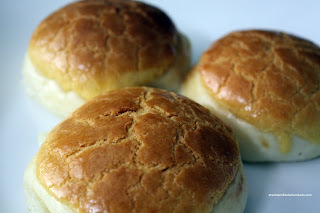 As for the Pineapple Buns, it was much more of the same. The bun itself was none too soft, even after nuking. The sweet topping was half decent. But I need to be fair and say that the bakery items here are more than acceptable for its location. 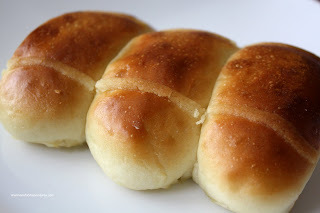 After all, it's situated in a predominantly residential area with no other Asian bakery within 5 km. I think the nearest would be Anna's on North Road. So it would be expecting a bit too much for the best of the best out here in a non-descript strip mall. Mind you, I've heard from Yum-O-Rama that their handmade dumplings are pretty good. In fact, I saw them making some in the back while I was there. This calls for a return visit to see if we got some more surprising eats here. Haha. I still have to try those dumplings. Mark's dumplings??? I'll have to bring it up next time and test his "comment diverting" abilities.